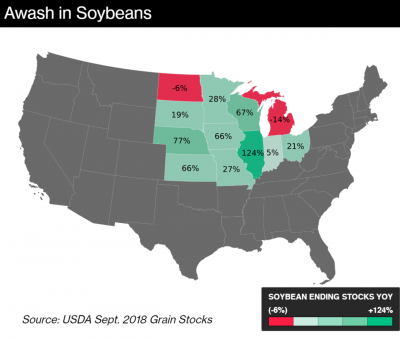 Updated monthly data last week from the U.S. Department of Agriculture provided additional insight into how the ongoing U.S. trade dispute with China is impacting the soybean market. 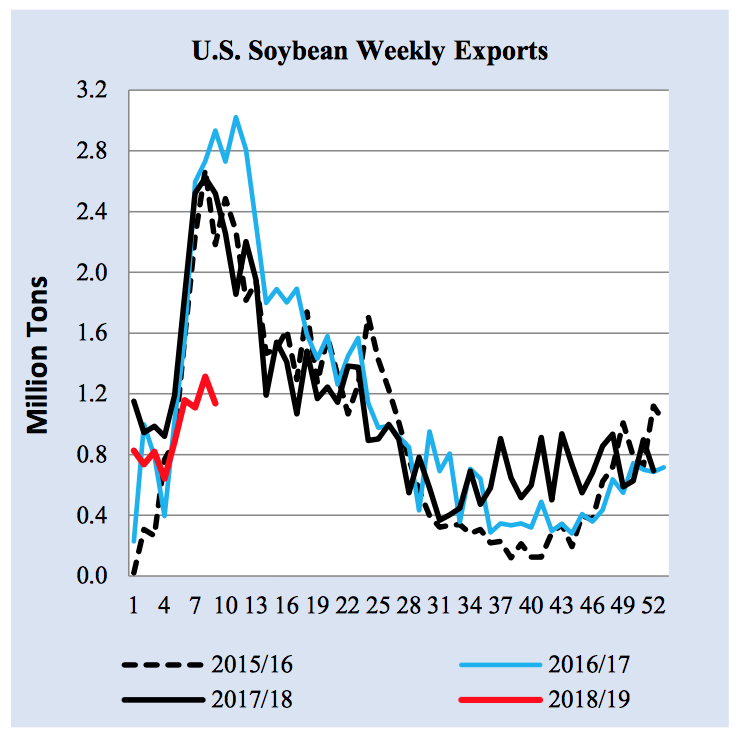 Today’s update looks briefly at portions of the USDA data, as well as recent news articles that have discussed U.S. agricultural export variables, and ongoing trade issues with China. 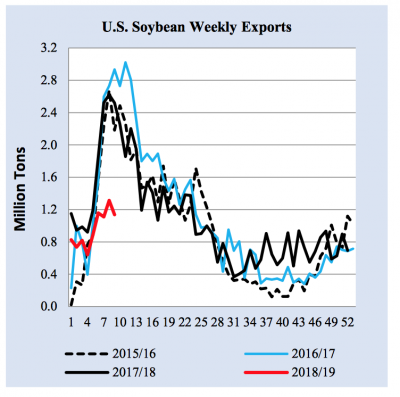 On Thursday, the World Agricultural Outlook Board’s (WAOB) November World Agricultural Supply and Demand Estimates (WASDE) report stated that, “Soybean exports are reduced 160 million bushels to 1,900 million with lower imports projected for China. The forecast protein consumption growth rate for China is reduced, which is reflected in the limited number of U.S. export sales this fall. Although sales to China are minimal, strong sales to other markets are expected to continue, which is likely to result in a larger share of U.S. exports in the second half of the marketing year. 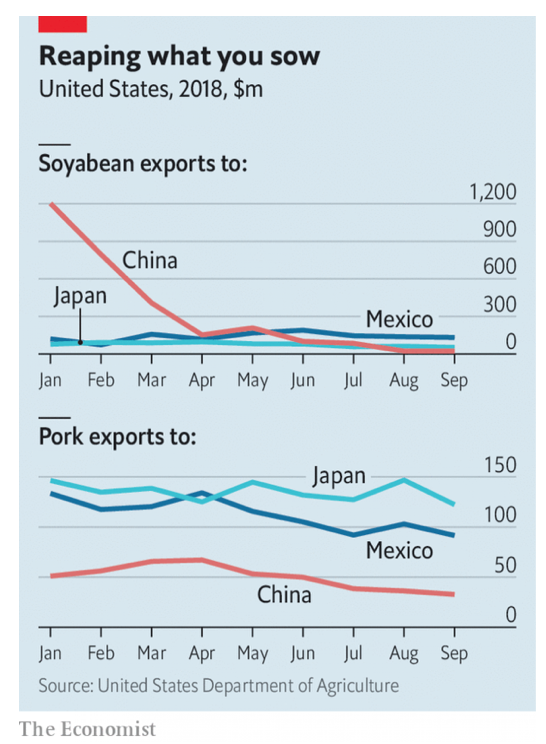 World Soybean Supply and Use (Million Metric Tons). 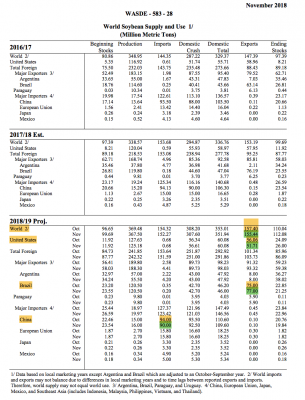 World Agricultural Supply and Demand Estimates. 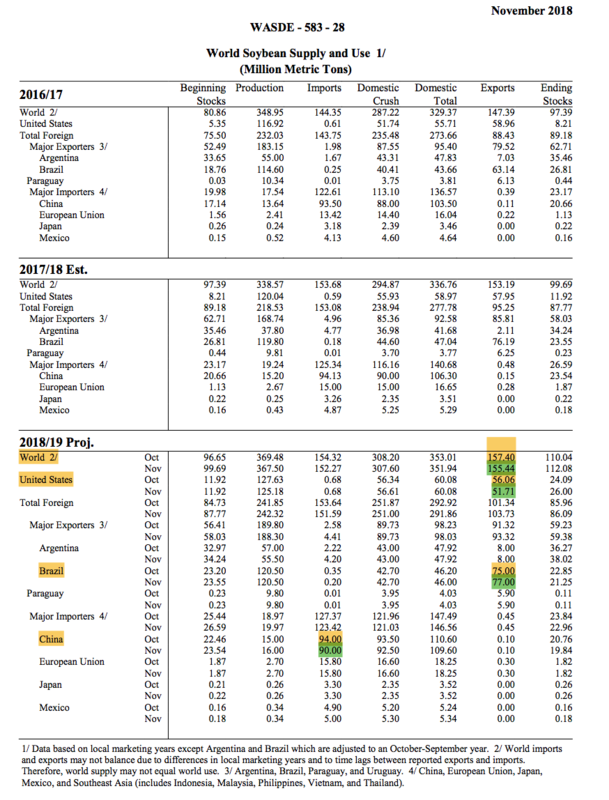 USDA- World Agricultural Outlook Board (November 8, 2018). 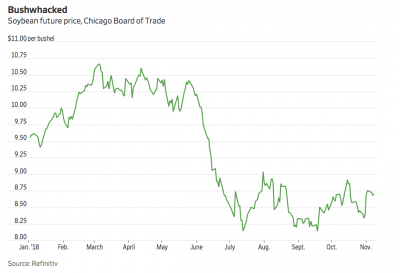 Oilseeds: World Markets and Trade. USDA- Foreign Agricultural Service (November 8, 2018). 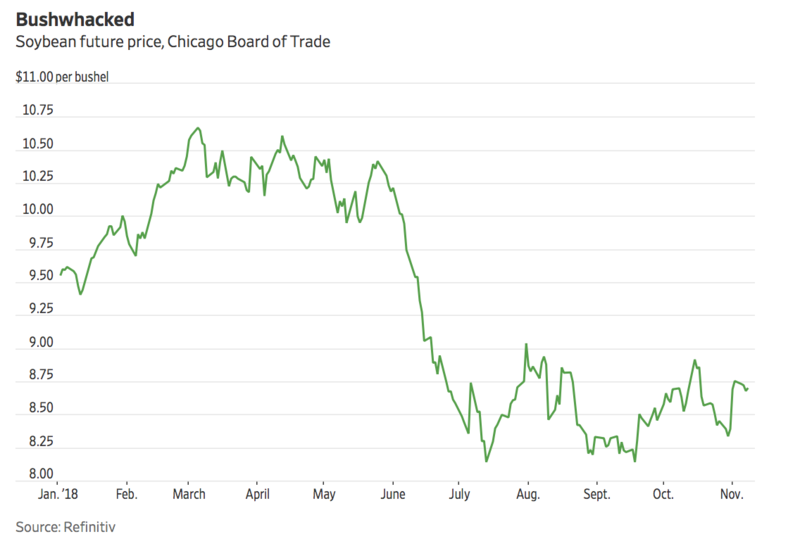 Since the beginning of the current trade tensions, purchases of U.S. soybeans by China have evaporated, with many previously booked sales being canceled. Bloomberg writers Shruti Singh, Isis Almeida, and Mario Parker reported today that, “Caught smack in the middle of the U.S.-China trade war, America’s soybean farmers are taking a huge gamble. Rather than selling the crop right away as they pull it out of the ground — as they do almost every harvest season to pay the bills — they are instead stashing it in silos, containers, bins, bags, whatever they can get their hands on to keep it safe and dry. 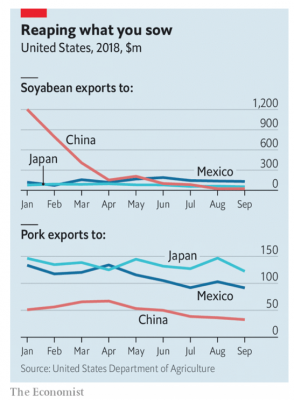 “Frozen Out of China, American Farmers Refuse to Sell Their Soy,” by Shruti Singh, Isis Almeida, and Mario Parker. Bloomberg News (November 12, 2018). “For some farmers, there is little choice but to keep their harvest. Millions of bushels have nowhere to go. Terminals in Portland, a key outlet in the Pacific Northwest to ship to China, are rarely offering bids. Supplies are backed up at terminals and elevators, even as cold, wet weather in North Dakota has left many acres unharvested,” the Bloomberg article said. 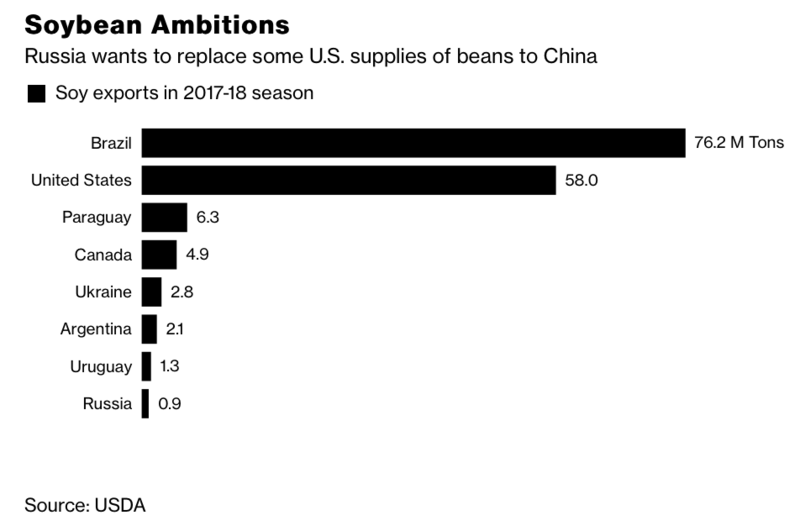 And last week, Bloomberg writers Anatoly Medetsky and Megan Durisin reported that, “In the search to replace U.S. soybeans, China is turning to Russia. “Russia plans to increase production of soybeans in the Far East for deliveries to China, Prime Minister Dmitry Medvedev told reporters in Beijing. The two countries are also planning to work more closely on other agriculture products, including rice, pork, poultry, fish, and to develop logistics. 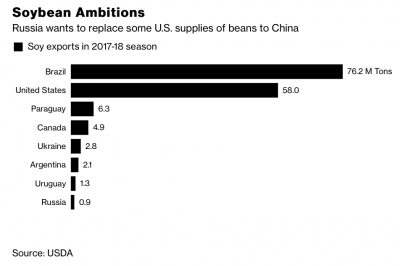 “China Turns to Russia in Search to Replace U.S. Soybeans,” by Anatoly Medetsky and Megan Durisin. Bloomberg News (November 7, 2018). “Tough row to hoe.” The Economist (November 8, 2018). The article noted that, “It is all reminiscent of the 1980s, when America suspended grain sales to the Soviet Union, interest rates rose, incomes sank and many farmers left the business. For now debt levels are climbing but still manageable. But much depends on how long tariffs persist. By the time the trade war ends, they may have caused enduring harm. “U.S. Farmers Aren’t Checking Trump On Trade,” by Nathaniel Taplin. The Wall Street Journal (November 8, 2018). And more narrowly on the Group of 20 summit meeting between the U.S. and China, Washington Post writer Heather Long reported last week that, “Trump trade adviser Peter Navarro said Friday that ‘trust issues’ with China are responsible for the lack of progress in trade negotiations, tamping down hope for progress in resolving the trade war when President Trump and Chinese President Xi Jinping meet later this month at the G-20 summit in Argentina. The Post article added that, “The Chinese have offered to buy more U.S. agricultural and energy products, but Navarro said Friday that is not enough. During the talk, he put on the screen behind him a lengthy list of grievances about unfair Chinese trade and business practices that included China stealing U.S. intellectual property and manipulating its currency.